See Washington, DC at its most magical on a 2.5 hour Christmas tour by bike! Under the watchful eye of a local guide, you’ll experience quintessential Christmas in Washington. Tour highlights include the Botanical Gardens Holiday Showcase; a hot chocolate stop; the exquisite decorations at the Willard Hotel and of course the Capital and National Christmas Trees! Snap the perfect family photo as tour guides share yuletide stories about what it’s like to spend Christmas at the White House. Don’t miss the chance to shift gears and awaken holiday cheers! See Washington, DC at its most magical on a 2.5 hour Christmas tour by bike! In a small group, and under the watchful eye of a local guide, you’ll experience quintessential Christmas in Washington. 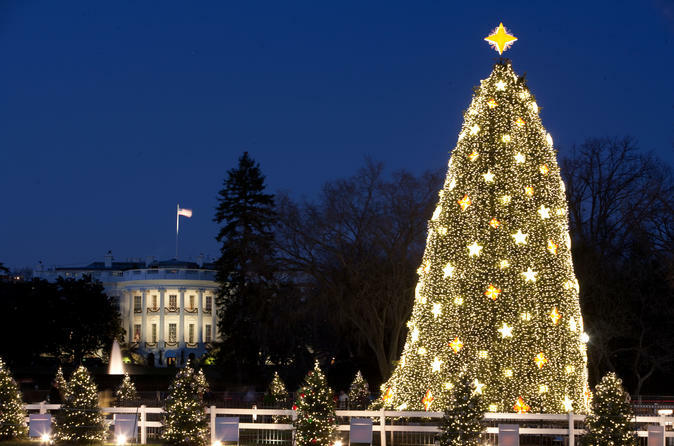 Tour highlights include the Botanical Gardens Holiday Showcase; a stop for hot chocolate; the exquisite decorations at the Willard Hotel and of course the Capital Christmas Tree and the National Christmas Tree! Snap the perfect family photo as tour guides share yuletide stories about what it’s like to spend Christmas at the White House. Don’t miss the chance to shift gears and awaken holiday cheer! Bike the sites as dusk falls upon Washington, DC and the holiday lights make the city alive.